People have to face regrets. Becoming mature means learning to accept what you cannot change, facing unresolved sorrows and learning to love life as it really happens, not as you would have it happen. When someone attaches unkindness to criticism, she's angry. Angry people need to criticize as an outlet for their anger. 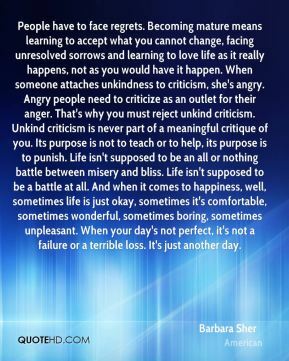 That's why you must reject unkind criticism. Unkind criticism is never part of a meaningful critique of you. 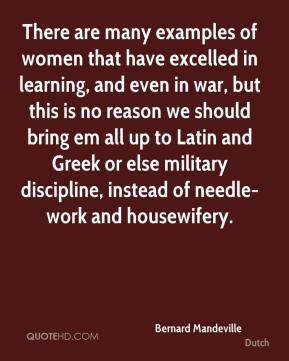 Its purpose is not to teach or to help, its purpose is to punish. Life isn't supposed to be an all or nothing battle between misery and bliss. Life isn't supposed to be a battle at all. And when it comes to happiness, well, sometimes life is just okay, sometimes it's comfortable, sometimes wonderful, sometimes boring, sometimes unpleasant. When your day's not perfect, it's not a failure or a terrible loss. It's just another day. 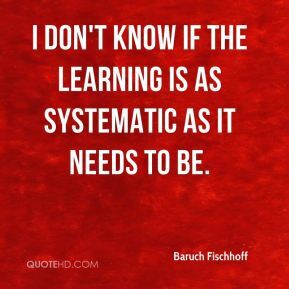 I don't know if the learning is as systematic as it needs to be. 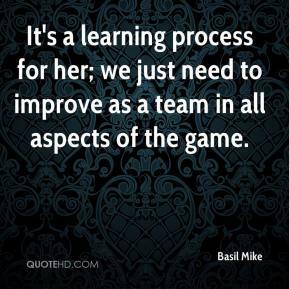 It's a learning process for her; we just need to improve as a team in all aspects of the game. I've been struggling so far being the rookie out there. It's a big learning curve stepping up from the regional to the national tour. (They're the) best in the world, so you don't get by being average. You have to be at the top of your game week in and week out. 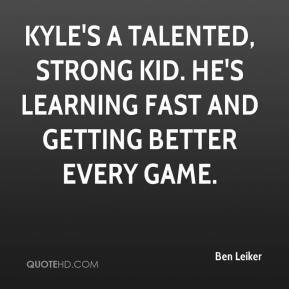 Kyle's a talented, strong kid. He's learning fast and getting better every game. 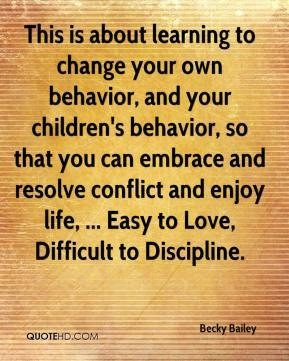 This is about learning to change your own behavior, and your children's behavior, so that you can embrace and resolve conflict and enjoy life, ... Easy to Love, Difficult to Discipline. One of the reasons we wanted to get the Lamoille done was to be further up the learning curve going into a tougher project. 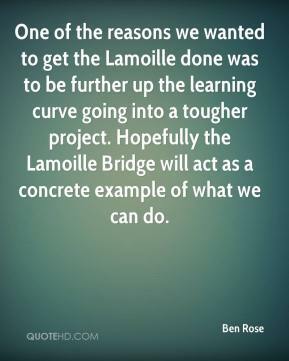 Hopefully the Lamoille Bridge will act as a concrete example of what we can do. 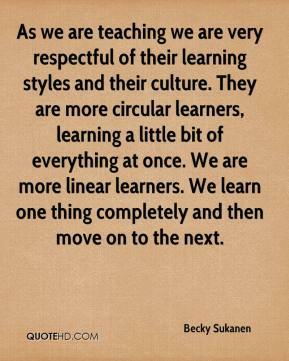 As we are teaching we are very respectful of their learning styles and their culture. They are more circular learners, learning a little bit of everything at once. 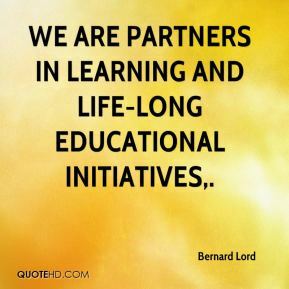 We are more linear learners. We learn one thing completely and then move on to the next. At first it was odd. 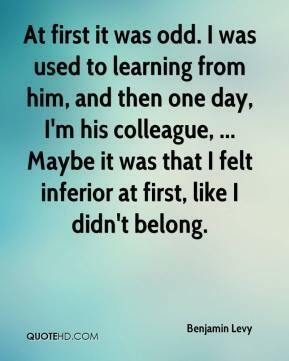 I was used to learning from him, and then one day, I'm his colleague, ... Maybe it was that I felt inferior at first, like I didn't belong. 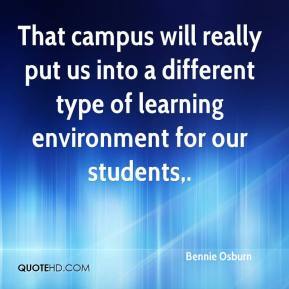 That campus will really put us into a different type of learning environment for our students. 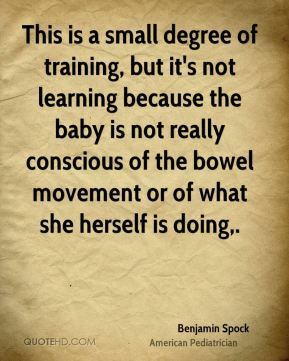 This is a small degree of training, but it's not learning because the baby is not really conscious of the bowel movement or of what she herself is doing. 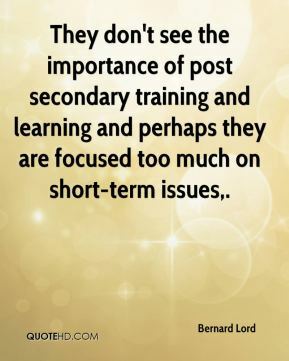 They don't see the importance of post secondary training and learning and perhaps they are focused too much on short-term issues. 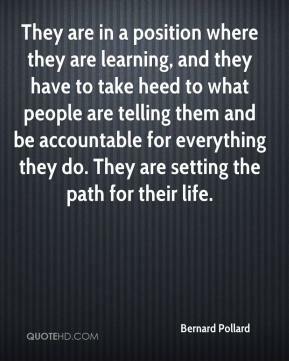 They are in a position where they are learning, and they have to take heed to what people are telling them and be accountable for everything they do. They are setting the path for their life. 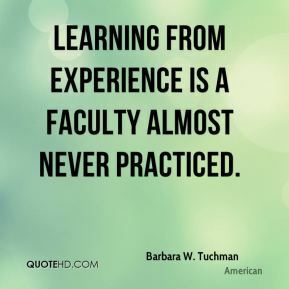 It is a learning experience for both the parent and the child. 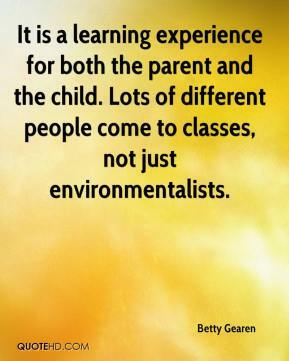 Lots of different people come to classes, not just environmentalists. 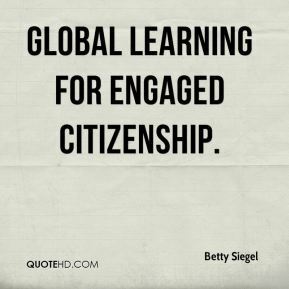 Global Learning for Engaged Citizenship. Not as many went in as we predicted. 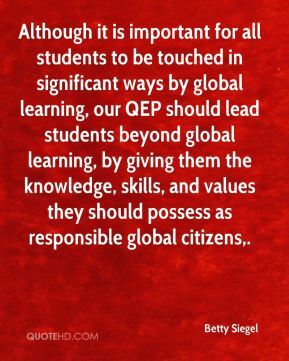 Kids are learning more in the schools. That's the good news. 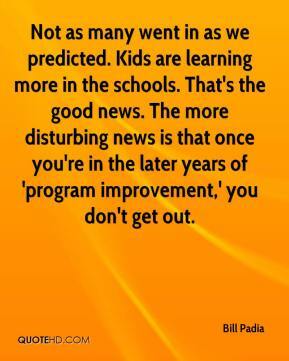 The more disturbing news is that once you're in the later years of 'program improvement,' you don't get out. 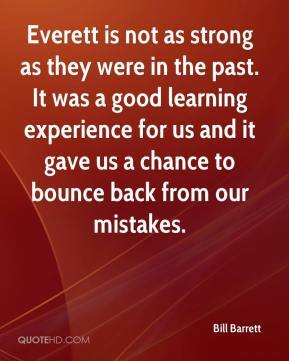 Everett is not as strong as they were in the past. It was a good learning experience for us and it gave us a chance to bounce back from our mistakes. Certainly, remembering everyone that's been affected, and we're learning from that. 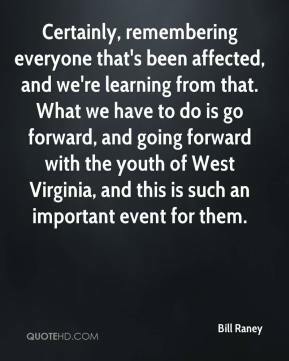 What we have to do is go forward, and going forward with the youth of West Virginia, and this is such an important event for them. We know that kids with quality early learning opportunities are more likely to graduate from high school, more likely to graduate from college, and more likely to earn higher income. 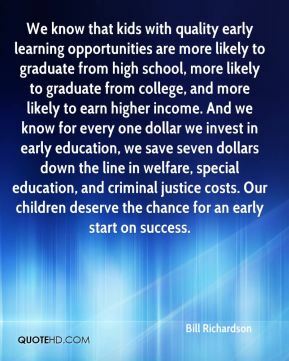 And we know for every one dollar we invest in early education, we save seven dollars down the line in welfare, special education, and criminal justice costs. Our children deserve the chance for an early start on success. 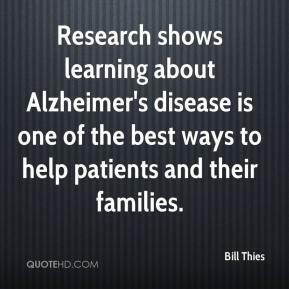 Research shows learning about Alzheimer's disease is one of the best ways to help patients and their families.